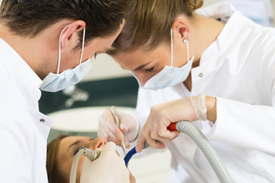 If a tooth is beyond restoration, it will require extraction. Some teeth can be extracted quickly and simply whilst others may require surgical removal. Extractions may also be necessary for teeth affected by advanced periodontal disease and for certain orthodontic treatment options. Extensive damage to a tooth — excessive decay or trauma-induced damage may be irreparable. Improved appearance — cosmetic dentistry procedures may sometimes promote the extraction of one or more teeth, particularly if they do not serve a functional role in the mouth. Periodontal disease — poor oral hygiene may lead to inflamed or infected gums. Left untreated the infection may lead to loose teeth that can’t be saved. Wisdom teeth — many patients’ mouths are not designed for or aren’t large enough to accommodate wisdom teeth. Considering a tooth extraction? We can help you, gently and efficiently. Give us a call on (02) 8677 0155 or get in touch online and we’ll discuss the details with you.